NSK Ltd. announced that it has developed a new member for its Robust series angular contact ball bearing, which is popular for use in the main shafts of lathes and machining centers that require a high vibration precision and revolution speed. This new offering achieves improved seizure resistance (more than 20 times in terms of time-to-seizure) and life compared to the conventional type, and it also helps to improve the environmental performance and productivity of machine tools. NSK will introduce this product in April 2013 and is targeting 500 million yen in annual sales in 2014. NSK display the product at the 26th Japan International Machine Tool Fair (JIMTOF 2012), to be held from Thursday, November 1 to Tuesday, November 6 at Tokyo Big Sight (Koto ward, Tokyo). In recent years, there has been an increase in the demand for machine tools designed for EMS*1 market applications due to the surge in processing work volume, and this has triggered the need for an even higher level of efficiency. In addition, machine tools for fabricating automobile components have continued to become more compact for improved productivity, driving the need for even more compact bearings that can withstand even higher loads. On top of all this is the never-ending need for lower power consumption and smaller environmental footprint, which in turn is resulting in the demand for grease lubrication. In order to meet these needs for higher reliability and higher load capability for use in severe lubrication conditions, NSK developed the E-type as a new member of its Robust series angular contact ball bearings for machine tools. This new type provides improved seizure resistance and possesses the following features for improved performance among machine tools. 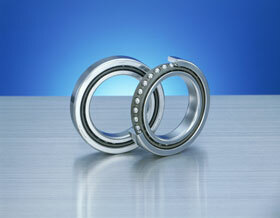 (1) Improved bearing product quality for greater durability in severe conditions of high loads and grease lubrication. (2) NSK developed proprietary material technology for machine tool bearings to withstand severe lubrication conditions. (1) Improved seizure resistance for better machining efficiency. (2) The above features enable this product to achieve more than 20 times the durability of the conventional type.